Chris Martin is known for his massive abstract paintings with their stark transcendental compositions. 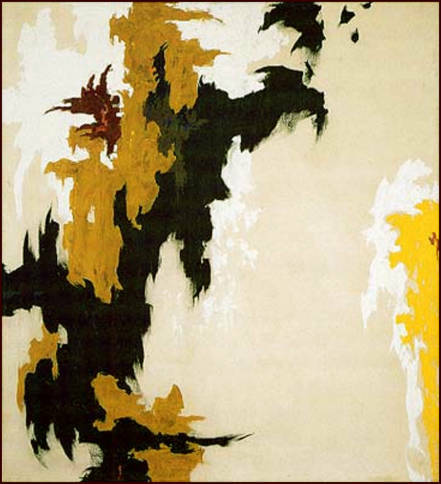 During a recent studio visit we spoke about his latest tour of Burma, painting, and Clyfford Still's concept of scale. JK: Did being in Burma make you think your paintings were too small? CM: In Burma a lot of the Buddha statues are really large, and they also do this thing which has influenced me for many years where they put a really giant statue in a very small space which does this fascinating kind of scale thing. JK: Aren't a lot of the statues carved into things, too? CM: Most of them are made of brick. They actually make a big brick thing and then plaster it. Then they build a brick temple around it, or within the big brick temple. Some of them are cast, some of them are carved marble. The really huge ones are made like a building. There are a lot of things about Burmese temple design, Buddha sculpture and painting that just particularly resonated with me. It had a big impact on me when I first went in’83 and then it really hit me again this time. I was trying to finish this one (painting) before you came so you could get a little better idea, but you can get an idea of it; it's coming along. This painting is called February Sunrise Asi Ghat Varanasi. JK: Well you've got all my favorite colors in it. CM: Yeah, it's like a "Who's Afraid of Red, Yellow, and Blue." Since this summer, since September, August really, I've been working black and white and unable to finish four really large paintings…they just went on and on. I'm just slowly pushing along. It's been a rough time. I think it's been a rough time for a number of people since September to finish anything. I think that there's just a sense that at the bottom a lot of what I'm doing, my whole enterprise here is kind of absurd, to make all these big paintings, and then you know, why not go for it. If no one can deal with a twelve-foot painting, well, if my art's desire is to make a twenty-foot painting I might as well make a twenty-foot painting and make it be what I want it to be. Most of my paintings were all taller than this. They were 129" tall, and then about five years ago Bill Maynes offered me a show. I realized all the paintings were too big for the gallery. So then I started working smaller. Now they're only 118" tall. JK: There was a nice article in Art in America in December. Carter Ratcliff was writing about the Clyfford Still show at the National Gallery, or maybe the Hirshhorn I'm not sure. CM: It was the Hirshhorn. It was a great show. I went down and saw it. It was a fascinating show. JK: I didn't get to see it, but a lot of the article was about his ideas about scale. CM: Well, Still is one of my big influences and teachers. One thing is I particularly blame him for making large paintings, because when I was a little kid, I remember going to the Whitney and they have that big brown painting, and I remember looking at that brown painting and really loving it. I think I was about twelve or thirteen, and I was a little kid, it seemed like that painting was as big as a wall. Now I look at that painting and it's 8 1/2 or 9 feet tall, it doesn't seem like that big a painting, whereas in my memory that painting filled my entire field of vision, in a way that was just a memory of an experience. But, more specifically, Still is a continuing influence in the way he uses scale, because he uses these very tiny patches of color in relationship to big fields. JK: Right, those little flames. CM: Those little things, which really make the scale something very different. There are a lot of Stella paintings that are twice as big as Clifford Still's but they have no sense of inner scale, and they look like postage stamps. They are kind of scale-less. They look great in a magazine and in reproduction but when you see them you have no desire to walk up to them, or to get back from them because they're just kind of scale-less. They're a graphed sort of colored in form, whereas the Stills are all about actual relationships within his field. You might have one tiny bit of orange, a thumbnail in relationship to seven feet of gray. JK: And maybe some little diddle thing on the edge. CM: On the very edge, out of your peripheral vision. He's constantly stretching you to make it really seem huge. And he's very specific about what he's doing.